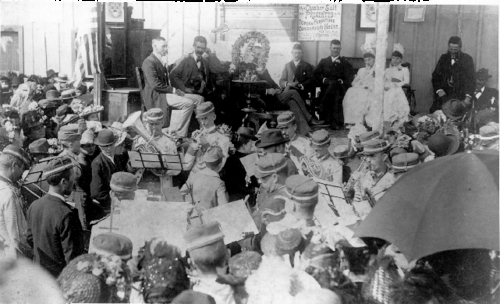 Members of Marshall's Band in a concert at the Topeka Furniture Consignment House in Topeka, Kansas. The sign on the wall reads: 'This Chamber Suit to be Presented by the Topeka Furniture Consignment House, 405 Kan. Ave. To the couple to be Married Thursday at 3 pm.' Also visible are people seated on a raised platform, and the men and women in the audience crowded around the band.